In an effort to combat spam, Google have stated that they make over 500 algorithm adjustments a year, combine this with the steady increase in aggressive online marketing tactics employed by businesses that are desperate to gain visibility across the internet and it becomes pretty obvious why they change so frequently. Google talks a lot about relevancy when delivering its results to users. Its mission is “to organize the world’s information and make it universally accessible and useful.” But this is no easy task. The constant algorithm updates are made to combat spam and junk websites and help deliver a result to the user that is appropriate and relevant to the search that they made. One excellent improvement lately, is the way that Google has learnt to understand the searchers intent. Upon typing a search query into Google it now instantly wants to know if the query is an informational search, a navigational search or a transactional search, in order to deliver the most relevant set of results. The shorter the search term though, the harder it is for Google to do this. For instance a search for “coffee” has today resulted in a blended search result for me, which shows wikipedia as the top result, followed by Yell reviews for the coffee shops in my area (note that i didnt type any town name into the search bar but i am logged into my Google account), a transactional result incase i wanted to buy some coffee beans, images of coffee, the Google places/local results for my area including shops such as Starbucks and Costa, News results for coffee, and finally the Nescafe website. If Google is unsure of your intent then it wants to cover as many options as possible when delivering your results. Now if i was to change this search to “make coffee” the results i am presented with are almost completely informational, including several wikis and how-to’s. If i change it again to “buy coffee” i would be presented with a set of results that are purely transactional, including two results from Amazon. A recent article by www.searchmetrics.com states that “Amazon.co.uk is the site mostly likely to be seen in paid search ads on Google UK, as well as being the most visible online retail site in organic search results”. Searchmetrics study places Amazon at position 6 overall in the top 20 most visible sites in organic search on Google UK, beaten only by Twitter, IMDb, Facebook, BBC and Wikipedia. This could be though because something else has changed massively over the last year or so, not for the better, and that is the way that results for branded search terms are presented. In the last year there seems to have been a big shift in the way that some transactional search terms are presented to the user. The first is the way that transactional results appear to favour Amazon listings (and sometimes ebay). I can understand that providing a link to sites like Amazon and eBay is important. After all, these are the two of the biggest online shopping websites in the world, but both have their own onsite search bars so why are amazon product listings dominating so much of Googles search engine results pages? The results page shown above is a screenshot taken from a search today for “Maxwell Williams White Basics”. You can see here that the manufacturer Maxwell & Williams hold the top three spots and Amazon hold the next three. Which means that any other individual retailers selling that particular product are listed from position 7 onwards. Here’s another results page from Google UK today. Again we see a similar result occurring. In a search for “64gb apple ipod touch” we see the top three positions are being held by the manufacturer followed by a result from Amazon. Following this we have an eBay listing and then three massive UK stores Tesco, Argos and John Lewis. The rest of the organic slots on this page are filled with reviews from tursted sources like “Which?”. So again, any smaller individual retailers have a slim chance of increasing their visibility through organic search for this term. Infact the only way for small businesses to gain any visibility on this page is through paid search. Cornell University carried out some eye tracking research on search engine users back in 2006. The results of the study are as follows: Position 1 of organic search attracts 56.35% of the clicks, position 2 13.45% and position 3 just 9.82%. All other organic results on the page receive less than 5%. Interestingly, according to this study, the worst position for your website to be listed at (other than on the second page) is position 7, which attracts on average just 0.36% of clicks for any given search term. Serving the manufacturer as the first result is about as relevant as you can get, but why is Google awarding the top three positions to the same website? And why do they seem to favour Amazon product listings over quality ecommerce websites? Providing results like this really seems to go against the Google mission. Are they assuming we are all so uneducated that once we have found the manufacturers website, or Amazon, we would be unable to navigate our way around the site successfully? Therefore serving not one, but in some cases, up to eight (!) 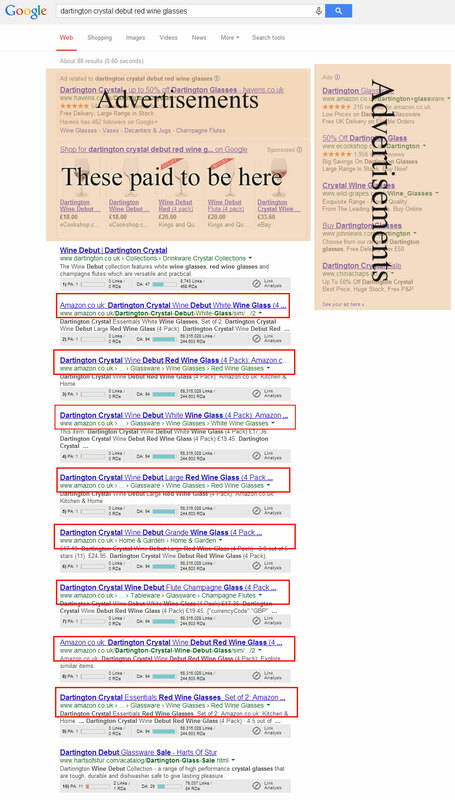 results from same website on page one of the SERPS. Wouldn’t it be more favourable to list just one result from each website? This would allow users to view a much more varied set of results at first glance rather than pointing them all towards the manufacturer or the big shopping websites like Amazon and eBay. Google is doing a great job at delivering results that are relevant to the intent of the user, but the blatant favouritism in search results that lean towards massive companies like Amazon, eBay, Tesco and Argos puts them in danger of upsetting the millions of small businesses that made Google what it is today.